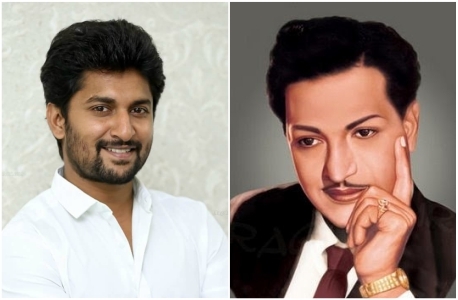 Home » Telugu » News » Is actor Nani playing legendary actor NTR in Savitri biopic ‘Mahanati’? Is actor Nani playing legendary actor NTR in Savitri biopic ‘Mahanati’? The producers have been discussing with many current top actors who would fit the bill and would look apt in the role. South Indian film industry will witness one of the biggest biopics in the history which is on yesteryear actress Savitri and is titled Mahanati. Directed by Nag Ashwin, ‘Mahanati’ will have Keerthy Suresh playing the titular role of Savitri and Dulquer Salmaan will be seen playing the role of Gemini Ganesan, husband of Savitri. ‘Mahanati’ is slated to be released in March this year which was confirmed by the makers in the teaser which was released over a month ago. The biopic will portray the personal and professional life of Savitri and will also portray the rise and fall of the actress. Having worked in more than 500 films in all the four South Indian languages, Savitri is one of the most iconic actresses in Indian cinema. Savitri has worked with the likes of Akkineni Nageswara Rao, Nandamuri Taraka Rama Rao and many other top actors during her career. And to play these actors in the biopic, the producers have been discussing with many current top actors who would fit the bill and would look apt in the role. If reports are to be believed, actor Nani may play the role of Nandamuri Taraka Rama Rao in the biopic and the makers have approached Nani already about this. Rumours are abuzz that Nani will most likely be the top contender for this role and will soon commence shooting for his portions in ‘Mahanati’. However, makers and the actor are tight-lipped about his portrayal of NTR in the film. The film is being produced by Swapna Cinemas and directed by Nag Ashwin who made Yevade Subramanyam with Nani earlier. The film is being considered to be one of the most prestigious projects in Telugu cinema since it is based on the life of legendary actress Savitri. Producer Swapna Dutt is leaving no stone unturned to make sure that the team behind the film has the best technicians. The cinematography of Mahanati is being handled by Dani Sanchez Lopez who is a popular cinematographer in Hollywood circles. Dani Sanchez Lopez has also worked on few Bollywood films which include Dil Dhadakne Do and Detective Byomkesh Bakshy. “Dani Sanchez Lopez, a recognised visual artist who works in the photography and video art realm, made a name in directing international ads, musical videos, documentaries and art forms. He is mixing formats for the period film that crosses several decades,” producer Swapna Dutt had said recently.